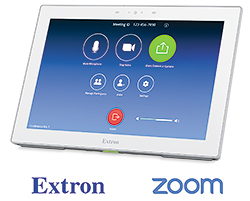 Extron Electronics, a market leader in the field of audio visual technology, have in the past few days announced that their HC 404 Meeting Space Collaboration System is now available preconfigured to extend control capabilities to Zoom Rooms running on an Apple Mac. That offers users a one-touch user experience for conferencing, collaboration, and AV room control. Those users need only a single interface on their Extron TouchLink Pro Series in order to control every conferencing and audio visual function within any meeting room or collaboration space. The HC 404 is designed to be a user-friendly AV system for meeting rooms. Alongside the new preconfiguration for Zoom Rooms, it combines video switching, scaling, signal extension, and system control into a transmitter and receiver pair that seamlessly integrates with a variety of room configurations. If you would like to discuss your requirements for Extron collaboration space solutions or other audio visual products please call us today on 0800 195 4825.